When deciding what to eat, two aspects are essential: cooking food that will provide enough energy to keep us going throughout the day and a price that will fit into a college student’s budget. I am not a self-proclaimed “foodie” or extraordinary chef by any means, but I’ve recently developed a desire to create nutritious and hearty meals. The series “In the Kitchen with A” will entail my new cooking self-discovery. I want to share with you dinner meals that combine similar ingredients throughout each meal and won’t break the bank for the week. On my quest for hearty meals, I chose the main ingredient to be beef. Beef has a great source of nutrients for our everyday nutrition such as protein (for strong muscles), zinc (helps create a strong immune system), phosphorus (builds strong bones and teeth) and complex B vitamins (helps you release energy from food). For this week’s meal, I found a recipe with a twist on an old winter comfort food. When I think filling comfort food, I think of potatoes. An easy go to meal is a loaded potato, but this loaded potato recipe is a little different because it combines the ground beef with it. As my oven preheated to 425F, I took two potatoes and jabbed a few fork marks into the potatoes, so they don’t explode when baking in the oven. I let them cook for 45 minutes. While the potatoes were cooking, I prepared 1 lb. of ground beef in a pan and added taco seasoning. I didn’t use onions for this meal, but you definitely could. 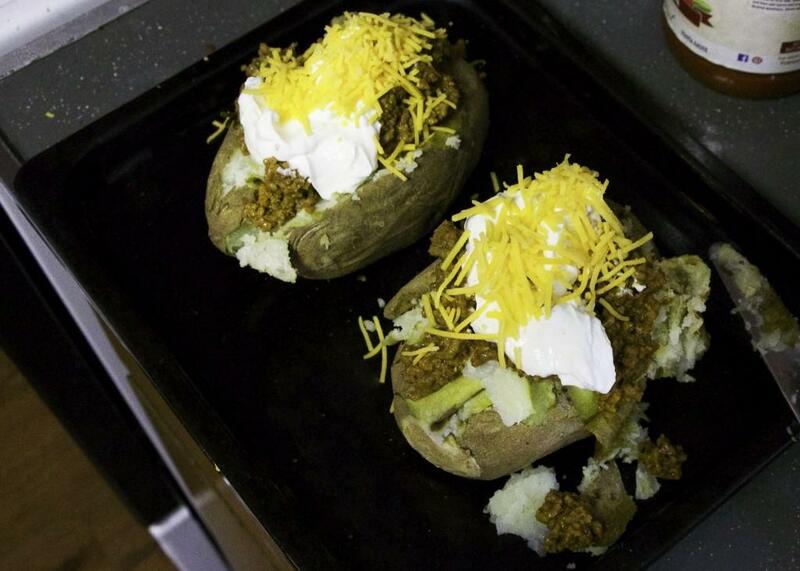 Once the potatoes were done, I cut through each potato half way and added in my ground beef, sour cream and shredded sharp cheddar cheese on top. I added salt and pepper to my preference. It was a super filling and delicious warm dinner. It’s great for a quick dinner or late night snack. Meanwhile, brown meat and drain extra grease. Add in seasoning mix as cook as directed on package. Cut potatoes in half; top with meat mixture and remaining ingredients.